So, what does Daruma mean? 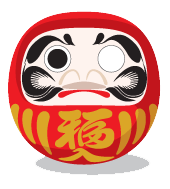 Daruma Technologies takes its name from the legendary Japanese daruma doll, a traditional symbol of fortune, resilience, and goal setting. Daruma dolls designed to stay standing – if toppled, they’re upright again in an instant. They come with empty eyes –by tradition, owners paint in one eye when they set a goal for themselves, and paint in the second only once the goal is achieved. Daruma’s mission is to empower growing businesses like yours with the custom digital tools you need to stand tall in a competitive market, and the know-how you need to establish and achieve your goals. Whether you envision a custom mobile app or a company-wide intranet, Daruma has the experience and expertise to make it happen. Let’s face it: All the newest, coolest technology in the world won’t do you a stitch of good if it’s in a product that’s hard to use or doesn’t do what you want it to. We make sure this never happens by putting YOU at the center of our engagement – our programmers won’t even touch their keyboards until we’ve gotten to really know your company and what your needs and concerns are. The digital marketing world changes fast, and cool tricks that worked last week may stop working next week. We stay on top of it all with continuous research and training – our team members not only have the latest advanced certifications from Microsoft and other major vendors, they also eagerly keep their ears to the ground for upcoming technical and marketing trends that could impact your business. Our strong, team-oriented culture powers us past the delays and communication gaps that sometimes bog down large teams and projects. All of our team members, whether based in the US or abroad, are equally accountable – and stay in constant contact to ensure everyone’s always on the same page when it comes to building you a solution you’ll love. We’re passionate about making sure you get what you want – we’ll always keep you in the loop and be available to answer your questions or address any concerns during development. And our commitment to you doesn’t end once your solution is deployed – we’ll always be there for updates, troubleshooting, and training to ensure you get the most from your tools. The Research Park at Florida Atlantic University, with campuses in Deerfield Beach and Boca Raton, exists to provide a supportive environment in which companies engaged in the research and development of new and innovative products can thrive. Many of the essential resources necessary for the success of the Research Park’s tenants can be found in their neighbor, Florida Atlantic University. Gateway Technolabs is a global information technology services, solutions and product engineering company with more than 1400 brilliant professionals serving customers across 30 countries in 5 Continents. Gateway has expertise in across a variety of domains including Automotive, Healthcare, Publishing and Media, Entertainment and Gaming, Banking & Financial Services, Manufacturing and Engineering, Retail, Public Sector, Software Product Houses and Independent Software Vendors. Offshore staffing has a mixed reputation in the software development industry: On the upside, it provides significant cost benefits and an additional pool of talent to ensure timely product delivery. But it has also raised concerns about quality, consistency, and accountability – a programmer or designer on the other side of the world may not be easily accessible for questions or have the time and resources to respond to your concerns. Daruma offers confidence-building local responsiveness and accountability teamed with the power of an international talent base. You get dedicated, U.S.-based consultants knowledgeable about U.S. business trends and practices ready to respond to your questions and concerns. These local contacts will also work with you proactively to help you clarify your needs and goals so that you get the custom solution that’s right for you. You also profit from the technical support and cost benefits of Daruma’s dedicated team of overseas experts. Daruma’s trusted offshore team members, many of whom hold the same high-level Microsoft and other professional certifications as our local programmers, give you the power of additional expert minds supporting your project while preserving your bottom line. Daruma’s strategic, proven business processes are built into your project plan to ensure that all professionals working on it, no matter where, are always on the same page and working with your requirements in mind. Now you don’t have to choose between local accountability and cost effectiveness – get the benefits of both.